Every year, we see a shift in design trends ranging from finishes and palettes to furnishings and materials. As innovations in the design world move confidently forward, we see the creation of new concepts, the invention of new materials, the curating of new styles and methodologies. All of this taken into consideration, Design Studio has laid out the trends that we see playing a big part in 2018 interior designs. This year, the bolder the color, the better. 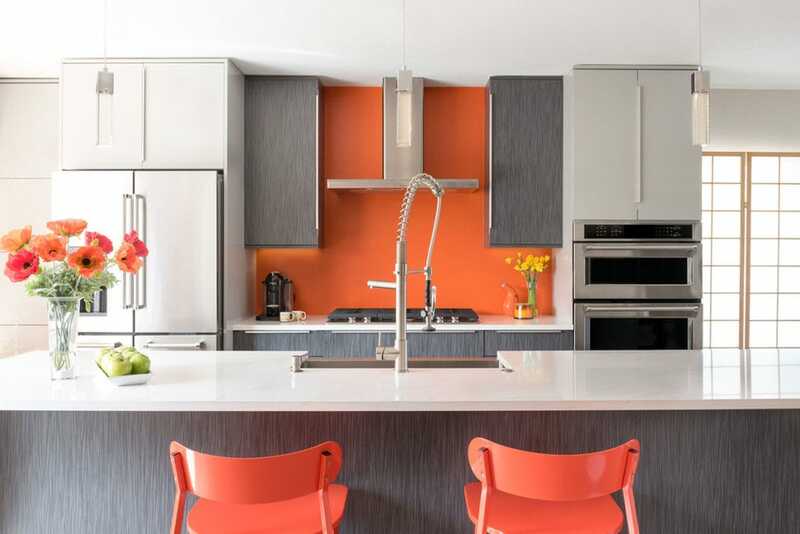 Both Pantone and Benjamin Moore, the industry’s top trendsetters and color experts, chose energetic tones as their respective winners for the color of the year. Pantone’s Ultra Violet, a lively grape tone, and Benjamin Moore’s Caliente, a rich, deep scarlet, let you make a statement experimenting with colorful accents. For finishes, we see matte black rising in popularity. Its contemporary neutral tone and uniquely versatile characteristics make it a modern choice for anyone looking to add a little edge to their design aesthetic. Meet Ultra Violet and Caliente. Open concept designs are the fastest growing trends in interior design. 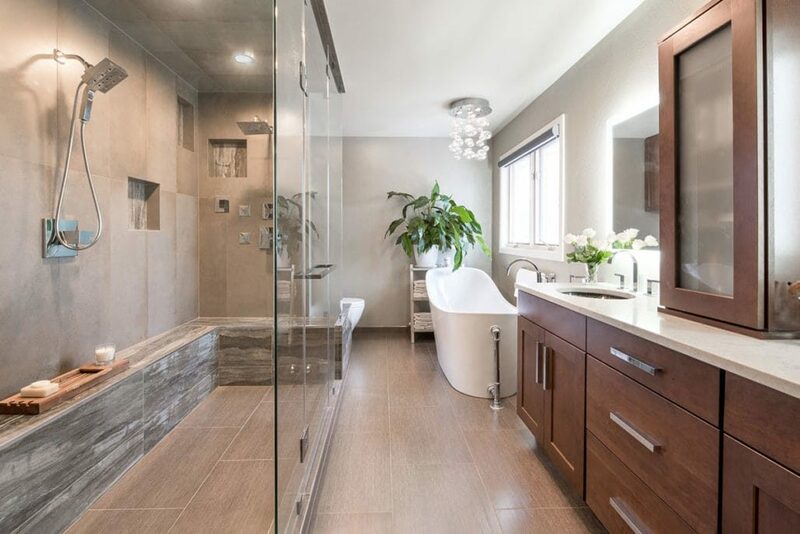 For the bathroom, partial glass dividers are the latest way to add more natural light to your space and increase accessibility. This half sheet of glass performs the functionality of a divider and shower curtain in a chic, elevated fashion. With the partial partition, you can show off a statement shower with ease while maintaining an open and airy feel where you want it most. Design Studio Interior Solutions original design. Concrete is favored across the design spectrum for its chic urban vibe. Striking yet humble, it wows minimalists and modernists alike for its distinguished industrial feel. Its cool and comforting gray tones create a relaxed atmosphere that’s strong and durable to the touch. In today’s on-trend styles, we see concrete being used in everything from walls and floors to coffee tables and countertops. For an easy introduction, try simple fixtures like lamps, planters, or candles. Contemporary and bold polished concrete floors. If you’re looking to throw a statement piece into your home’s design, look for seating in bold colors and patterns. A colorful sofa perfectly balances form and function while adding a splash of color to the room. Not ready to commit to a statement color? Look for colorful slipcovers that let you see if a color works with the rest of your design. 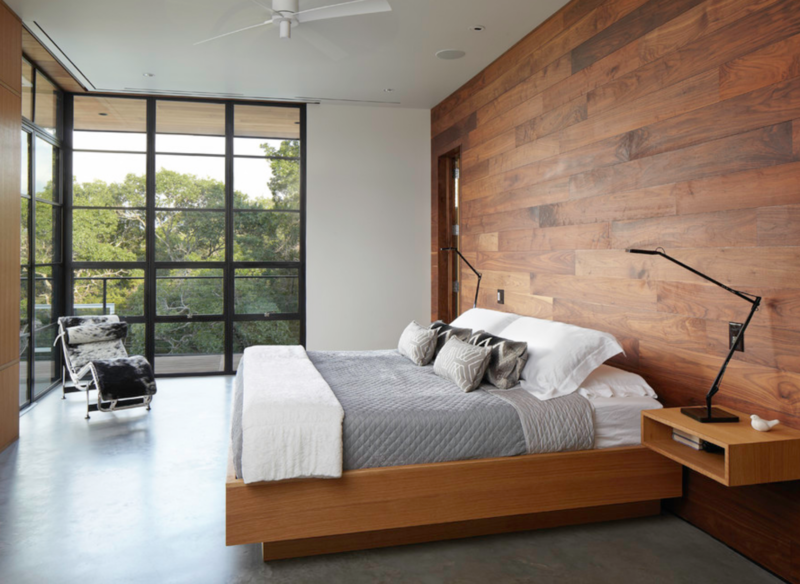 Your bedroom should be a place of rest and relaxation where you can unplug, unwind, and get a good night’s sleep. Your design should support this stress-free sentiment, not hinder it. It’s best to avoid ornate design and jarring colors—save those for more public spaces where they will be more appreciated. Let calming colors lead your room’s design and decor. When picking your colors, opt for pale blues, grays, purples, or pinks. These quiet tones are scientifically proven to reduce stress. A good night’s sleep starts with a peaceful environment, and smart design is the first step. Simple, clean, and monochromatic design. A tile backsplash is a quick and easy way to add personality and color to any kitchen style. Subway tile, characterized by its large glossy rectangular pattern remains as popular as ever. However, we’re seeing more and more unique patterns as homeowners experiment with shapes, textures, and tones. 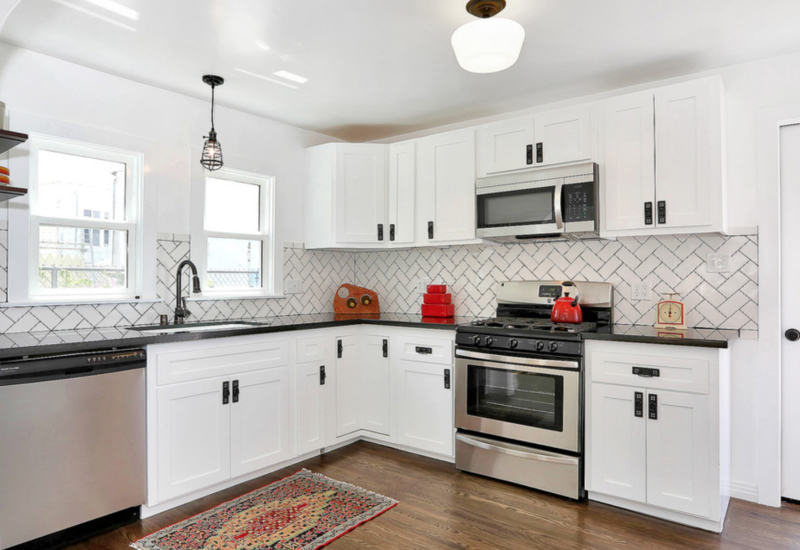 Herringbone, arabesque, and hexagonal tile patterns are popping up more and more frequently as a fun way to personalize your cooking space. Simple and sweet subway tile backsplash. Spring is right around the corner and that means all things floral. But this year, flowery prints are getting a big update. Look for patterns with large, close-up blooms. Oversized floral patterns make a fantastic accent pattern, come in almost every color scheme and application imaginable. 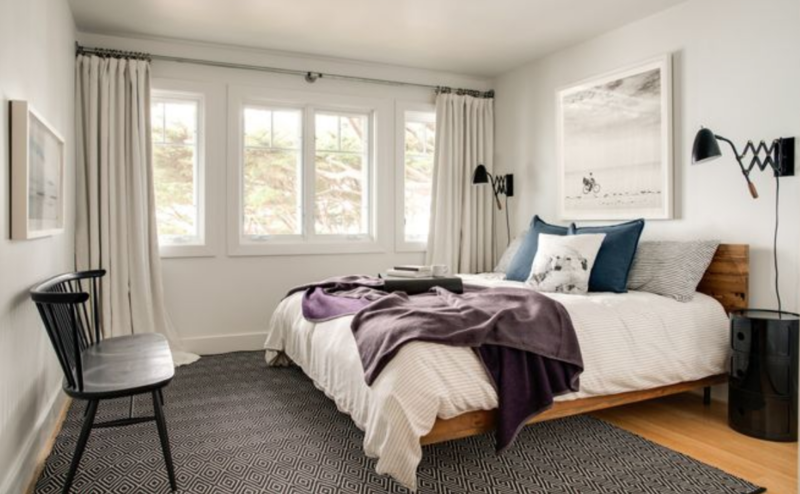 Mix up bedding, curtains, wallpaper, and rugs with this classic look. Pick up some stencils so you can customize your own look.